Brentano Designer Aaron Mensik has great color sense, so we tend to rely on him as our colorist in the design studio. Usually before he starts to color a pattern, we will talk about how and where the fabric will be used and what kind of color it should have. For instance, if the fabric is to be used in a vertical application, we tend to want colors that are clear and soft. We might not produce any dark colors at all. 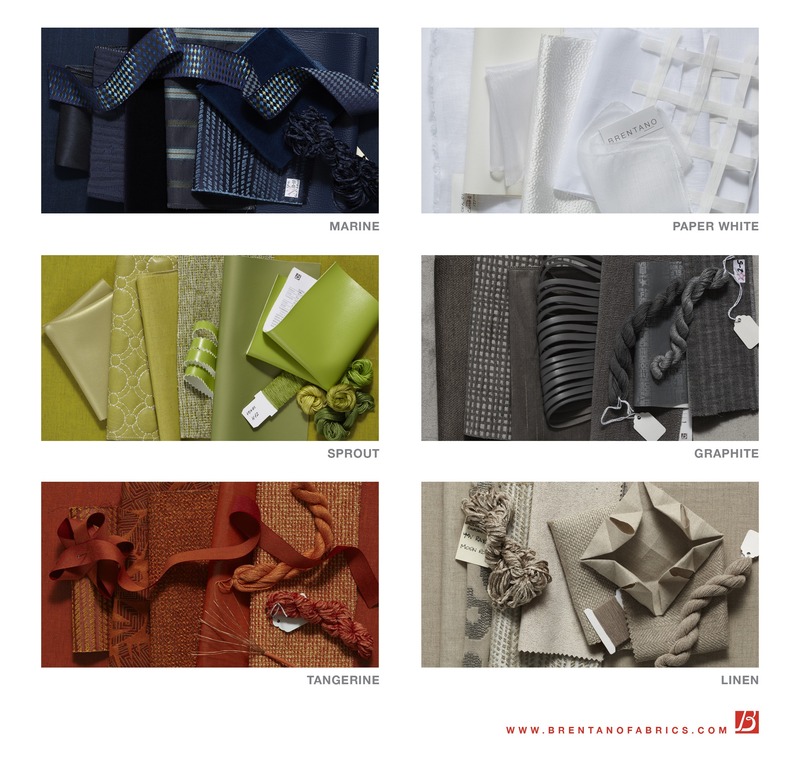 There are also differences for residential and hospitality, healthcare, etc., fabrics. We also talk about what color we should feature when we bring out a new collection, and we pay particular attention to producing that featured color. Sometimes we are limited by the yarn banks that the mill stocks. In America, both residential and commercial color senses tend to be neutral and subdued compared to those of Mediterranean countries, so we sometimes have to look to European mills for clearer and brighter color yarn banks. Aaron and I tend to like either neutral colors or saturated colors, whether dark or pastel, it must be saturate. We have produced eco fabrics in many different fibers except for linen. Linen is a rapidly renewable resource, and there are new innovations that make it even more eco-friendly. We are adding Oeko-Tex certified Eco-Linen in our spring collection, and, in addition, we also are forecasting the natural linen color. Flax is one of the noblest fibers and its natural color is also the most beautiful. It is near impossible to reproduce linen color. We almost always try a linen color in our color development projects but we have a very low success rate. Once in a great while we get a pleasant surprise. Strictly speaking, natural linen color is not reproducible because it is not one color. The impurities which carry color contribute to the complex hue of natural linen color. So natural linen is not merely a flat color. It is like putting on a base, sometimes a contrasting color, before the surface color is applied in an oil painting. Most painters know that this procedure adds texture and richness to the theme color. Linen color is complex in this way. Linen as a color is not too light so it helps to hide soil. It is neither too warm nor too cold, although different crops produces color in slightly different casts. I have seen pinker linen colors and a bit greener ones. Nonetheless, they maintained their naturalness and the lot differences are within the tolerable range. Theoretically, this is not a color but it functions as one. People who work with colors recognize color in a dimensional way. It is not just a concept. Product designers experience how colors reflect differently in different materials. Their job is to be able to foresee the color quality, sometimes by trial-and-error, and use all available means to control it. For example, if the same dye Note 1 is used on several different fibers, the white will look different on wool compared to cotton or silk. The elaborate development of stain and oil resistant finishes in recent years. The concept of disposables and the focus on “image” marketing in the commercial world, especially in the hospitality industry. In this regard, the decorative elements in an interior are not meant to stay very long, only between 3-5 years. Of course, many other factors influence our color selections. Aaron and I talk about what colors have been selling and the feedback we’ve received from our reps and clients, and we look at fashion trends and market research from various sources. Taking all of that into account, we’re very pleased to present our 2012 color forecast. Note 1: There is no white dye; most natural fibers are bleached to white, not dyed. Therefore noble fibers are bleached to manifest their own glowing material quality. On the other hand, the natural state of petroleum-based fibers such as polyester is transparent. Tyatanium dioxide is added to the fiber to make it opaque and white. You are currently reading Brentano Color Forecast at Woven-Words.